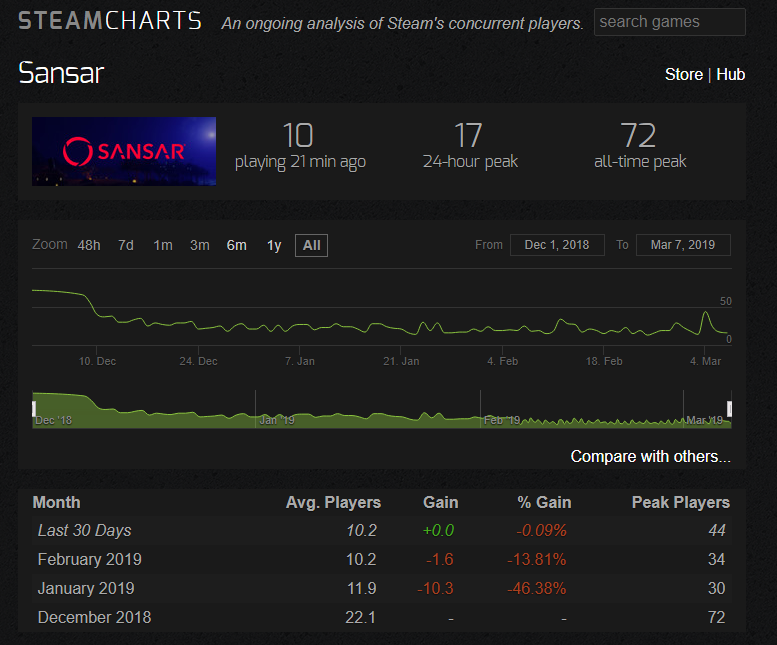 Sansar launched on Steam three months ago on 5th December 2018 and the usage at first was starting to pick up. The all time peak reached 72 players in early December 2018 according to Steam Charts which tracks concurrent players. The average number of players was around the 22.1 players mark. Today the average players count has gone down to 10.2 which is pretty low. It’s important to mention that all the data is powered by Steam for reference. Since last year the overall Sansar concurrent players usage has dropped but just bumping along nowadays. There was a slightly large peak of 44 players that was recorded on Monday 4th March 2019. On a daily basis though it’s not really been over the 30 players mark apart from the odd occasion like a big event or inworld meeting. Thx for the numbers, Daniel, despite my oath to never report about Sansar again, I’m gonna reblog this very significant development. I hate to say I told you this would happen, and it kinda saddens me to see my premium fees being sunk into this failed shitshow, particularly since this usually never happens. Me beeing right about something isn’t in the cards. Anyhoo, thankyouverymuch for briniging it to the sceptic’s attention again. I know you said this would happen months ago. Sansar has only been on Steam for three months and the player numbers have been pretty low so far. There have been some peaks in recent months. I would imagine this trend will continue throughout 2019 unless something big happens which draws in more active users. I’m hearing that loading times for folks are taking ages in Sansar which is a big issue I think for the lab to sort out. I’ll probably blog again about this at the 6 month and 12 months mark to see if anything has changed or no.